Advantages: Wide range of colours and markings in this unique theatre; excellent profiles; interesting text; many relevant captioned wartime photos; includes coverage of Jagdwaffe activity over Malta. "Jagdwaffe - War Over the Desert" describes the fighter force's operations over the desert and in the Mediterranean theatre from 1940 to 1942. The camouflage and markings during this period transitioned from European greys and greens, to hastily improvised desert camouflage using Italian paints, to the use of new official RLM colours from summer 1941. Operational issues regarding the desert war, in addition to a discussion of Malta, is included in this volume. More than 200 wartime photos, including ten colour photos, are usefully captioned and highly relevant to the subject matter. 26 colour profiles highlight the variety of the schemes. These are reproduced at page width and will provide plenty of inspiration for modellers. Several colour scrap drawings and a map are also included. 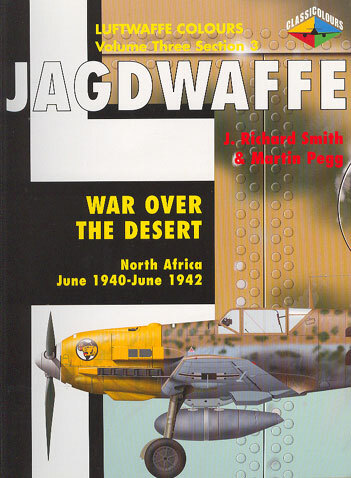 "Jagdwaffe - War Over the Desert" is a concise and attractive package for a fairly broad subject area. This is another worthwhile instalment in Classic Publications Jagdwaffe series.